Finding Your Voice - Ballarat District Orphan Asylum, Orphanage, Children's Home 1865-1980's Never Hidden Or Forgotten! Freemasons on the Goldfields is an intriguing story of men and lodges, secrets, symbols, jealousies, achievements and civic pride. It traces the craft from the early stonemasons and cathedral builders of Europe to the establishments of lodges in Australia and Victoria . 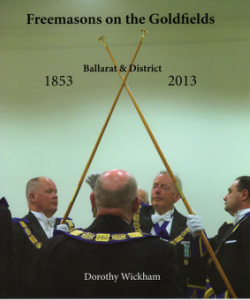 Dorothy Wickham shows how the growth of freemasonry in Ballarat reflected the rapid expansion in welfare and services the growth of commerce, the interest and support for education and the arts, and the beautification of the environment. The Freemansons also behind getting the Ballarat Orphan Asylum up and running. The book tells a little about how it all started. An Orphans Escape As late as 1961, nearly seven thousand children were in the custody of Victorian institutions or under the care of the Children's Welfare Department. Frank Golding and his two brothers were among this number. On Christmas Eve 1940, the boys - Frank (not yet three), Bob (four), and Bill (six) - found themselves on the doorstep of an orphan asylum. They were certainly not orphans, but the boys spend most of their lost childhood inside the walls of the Ballarat Orphanage. It would take Frank fifty years to learn what had been happening 'outside the wall' while he was inside, and what had happened to his parents, why didn't they come for him, why wouldn't anyone tell him.....Frank's childhood puzzlement lasted half a lifetime. Frank finally found out that his parents deeply cared for the boys, but the battle for their children had been at a huge cost. "Behind and Beyond the Brick Walls"
By Bob Golding. A lively account of his life with courage, compassion and humour. Click Here to hear some stories. Finding Your Story provides a comprehensive and cohesive resource of government and non-government record and archival collections in Victoria relevant to the Stolen Generations and their families. It seeks to assist in breaking down the barriers that surround access Add to dictionary Your Story's useful and practical because it has been written and presented in a clear, concise and culturally appropriate manner achieved by extensive consultation and input from Koori user groups. The Stolen Generations The policies of past governments that led to the separation and removal of Indigenous children from their families are well documented. Indigenous people who were separated from their families as children and those who had their own children removed have lived for years with the hurt and humiliation caused by these police sand practices.Thousands of Indigenous children throughout Australia were placed in institutions or with non-Indigenous families. This was a painful experience and for many, pride in family was diminished, self identity severely damaged and contacts with family and community members lost. Some children were never able to return home to their families and the links to their community were severed.Many of these children had multiple placements in children’s homes and in foster care. Some became involved with the State’s juvenile justice system and ultimately, the adult prison system. MANY VOICES This book "brings together testimonies from all sides of the history of Indigenous child separation in Australia. The book includes the voices of children who were taken from their families, adults who cared for them in institutions and Missions, families who took them into their homes and government officers who enacted official policies. Hundreds of individuals told their stories to the National Library of Australia's 'Bringing Them Home' Oral History Project - their words propel this history from start to finish. Editors Dorren Mellor and Anna Haebich have drawn together a diverse group of expert writers, whose words are interwoven with artworks and poetry by Indigenous artists, many of whom are interviewees for the Project. The audio CD brings the voices of the interviewees to life. 'Many voices' presents a spoken history that remains as compelling as the moment these events occurred. In their generosity and courage, its contributors have created an invaluable gift to all Australians.